March 21, 2009 — Those of us foreigners who live in Mexico are getting a lot of concerned phone calls and emails from family and friends in the US and Canada. They are seeing sensational news stories of dead bodies and drug cartel violence here in Mexico, and tend to assume that we are living in a war zone. They don’t think about Mexico being a very large and diverse country. I wrote back to one worried friend who lives in a small town in the rural American West, that she probably didn’t worry about getting caught in the crossfire of gangs in Brooklyn or LA. I did say it was *almost* but not quite identical here, and she wrote back still most worried. This is typical of what other expats tell me is going on with them too. Happily, some expats decided to reply with a new website about the truth of what it is like to be here. http://www.thetruthaboutmexico.com is aptly named. It’s got a lot of great articles, and it’s also got a terrific blog list running down the sidebar. So go take a look, and if you are here and dealing with worried friends up north, send them to that website. And you may need to get your spare bedroom ready for guests! 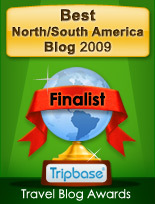 My Blog Makes a Top 10 List for Mexico Blogs! There are many great Mexico Blogs out there, and while we are still getting lots of traffic from the Lonely Planet Awards, I wanted to give them a shoutout so they could get the exposure they so much deserve. I knew most of the other blogs on the list, but found a couple of gems I hadn’t seen. Because I’m blogging on several topics besides Mexico, I don’t have time to read widely on any one subject, and I’m always behind on my reading, it seems! The crown jewel is one of my very favorite cities in Mexico, Guanajuato. So I was pleased to hear that writer Doug Bower had done a guide to this compact and steeply-hilled city. I wrote a walking guide to Olympia, Washington, when we lived there, and that left me with an appreciation for the task of guidebooking. This travelogue is for American, English-speaking European, and Canadian travelers who have grown weary of the typical Mexican vacation. It is a travelogue with strong guidebook features about the city of Guanajuato (the capital of the state of Guanajuato). The book features the author walking through the city of Guanajuato and describing the areas of interest to tourists and most importantly saving the unaware tourist from getting lost in a topographically confusing terrain. Doug Bower is a freelance writer and book author. He’s authored several books on how to expatriate to Mexico and on learning Spanish. He lives in Guanajuato, Mexico, with his wife, where he is a writer for “Ventana” Magazine.